To make a one-off donation, please click on the Just Giving link below, where you will be directed to the site’s secure payment page. For more information on ways you can donate, please click on our Donate page. The Grand at Clitheroe Ltd. has committed itself to raising awareness and funds to deliver daily meals to chronically hungry children in their local schools, based in Eldoret, Kenya. The Solomon project is advocating the needs of some of Kenya’s poorest children. It works in partnership with Mary’s Meals, providing meals to chronically hungry children in their local school. By using local produce and community volunteers we are able to feed one child in school for a whole year for just £17.00. 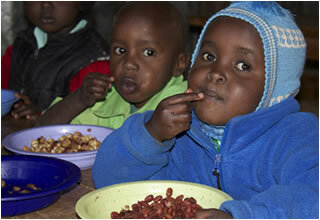 The Solomon project provides daily meals to chronically hungry children in their local school. The children then have an incentive to attend school and through education, gain a better future for them selves and their communities. When the gnawing pain of hunger is removed, concentration in classes improves. Better grades lead to greater opportunities in life and a chance to break the cycle of poverty. So far the Solomon project is feeding 5200 in schools but with your help we are looking to extend our work. It costs just £17 to feed a child in school for a whole year. That's just 8 pence a day!!! Would you consider donating or fundraising? Eldoret is a town in West/central Kenya, which is the nearest conurbation to the remote area of Turkana. Many people fleeing the drought conditions have ended up here. Previous to that, Eldoret was the epicentre of the post election tribal conflict from 2007 onwards which resulted in neighbour massacring neighbour. Many of the children being fed by the Solomon project are orphans as as a result of that period. The schools feeding programme is mainly centred on the slum areas and is aimed at getting street children into schools. Their situation is desperate. They live in gangs on the streets. Most sniff glue to suppress hunger pangs and to dull the pain of life on the streets. They are given this by adults who run the "barracks" where they gather for safety in numbers. They are constantly subjected to brutal attacks and have horrific stories to tell. The influx of children who've arrived as a result of the drought has made the problem even worse in the last couple of years. Previously it was only boys who were living like this, but now there are girls too which has given rise to th e new phenomenon of street families, where babies are being born on the streets and in the rubbish tips where the children live. We are told many of them, once weaned off the glue, are very intelligent and make good students. 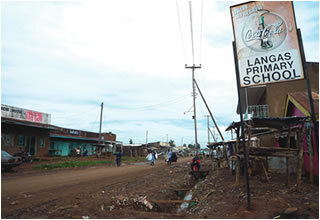 After watching a sky documentary on gangs, Rose Lancaster was prompted to visit the Street children of Eldoret for herself. She witnessed the desperation of the street children and the hopelessness that prevailed. We looked at ways we could help the town of Eldoret and the poverty of the street children. After many months of exploring the great projects already available to the street children, we were made aware of the wonderful work of Mary's meals. Mary's Meals is a charity providing daily meals in schools to 500,000 chronically hungry children worldwide in their local schools. As Mary's Meals were already operating in Kenya we approached them with our concerns for Eldoret and the poverty that we had witnessed. They shared our concern and desire to help. A partnership was created, 5 schools were picked to start the school feeding programme in Eldoret, 2 schools were to be funded by Mary's meals and the Solomon project committed itself to the other 3 schools. With their experience and existing network already set up in Kenya, they were ideally positioned to practically deliver the project on the ground. The Lancaster foundation donated the finances to build the 3 kitchens needed to equip the schools to start the schools feeding programme. September 2010 saw the launch of the schools feeding programme. We want to see a difference in the lives of children in Eldoret. We aim to continue to provide food in schools, practically being delivered by our partner Mary's Meals. We aim to continue raising awareness of the daily reality of life for children in Eldoret and raise funds to extend the feeding project throughout the schools in Eldoret. © 2011 The Solomon Project | Website Designed by Current Creative.